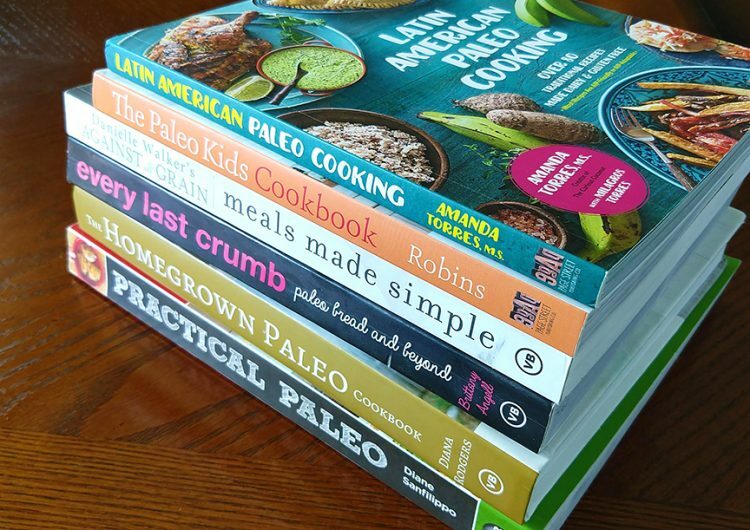 My family has been eating a Paleo-ish diet for 6-8 years now and I have purchased, won, and borrowed quite a few cookbooks. They run the gamut of simple meat and veggie recipes that are naturally paleo to grain free baking books that try to replicate junk food favorites! There are a lot of good cookbooks out there, but it really depends on what you’re looking for to find ones that work for you. What I mean by that is that if you don’t have a lot of time or don’t want to spend your time in the kitchen, then a book with a lot of multi-step, complicated, albeit delicious recipes, isn’t likely to be worth the purchase. If you are looking for recipes to replace traditional favorites, you may not mind a few extra steps in order to create a healthier version of a favorite meal. 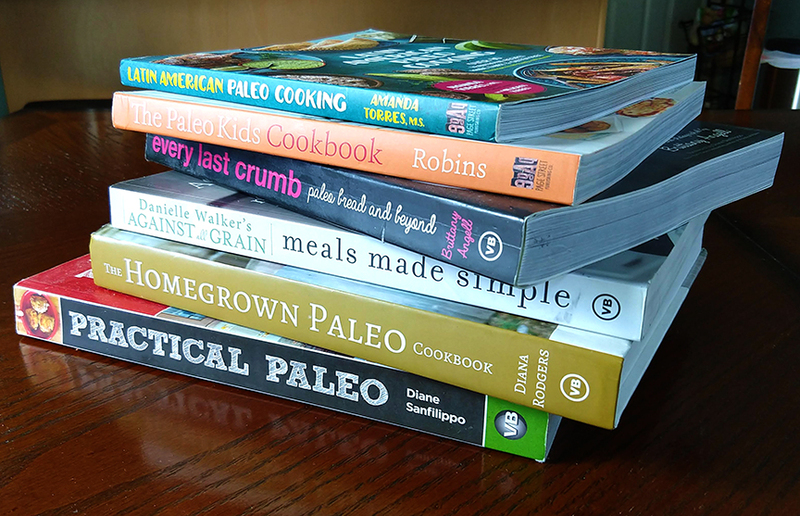 Below are my most used paleo cookbooks. As you will see, I like each of them for very distinct reasons. Half nutrition information and meal plans and half cookbook, this is the best paleo/real food resource out there. This is without a doubt my most-used cookbook! Go get it now. 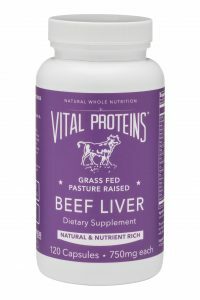 It is an invaluable nutrition resource! It really is the Paleo bible! Good nutrition is explained well and is easy to understand. I’ve probably made more of the recipes from this book than any other cookbook I own! The recipes are not fussy or complicated, just really good! I love this book because it serves a great nutrition reference book in addition to the easy, family-friendly recipes that don’t take long to prepare. My favorites: are Zucchini Pancakes, Bacon-wrapped Chicken Thighs, Balsamic Braised Short Ribs, Sauteed Red Cabbage with Onions and Apples, and Sweet Potato Pancakes (used as a burger bun). 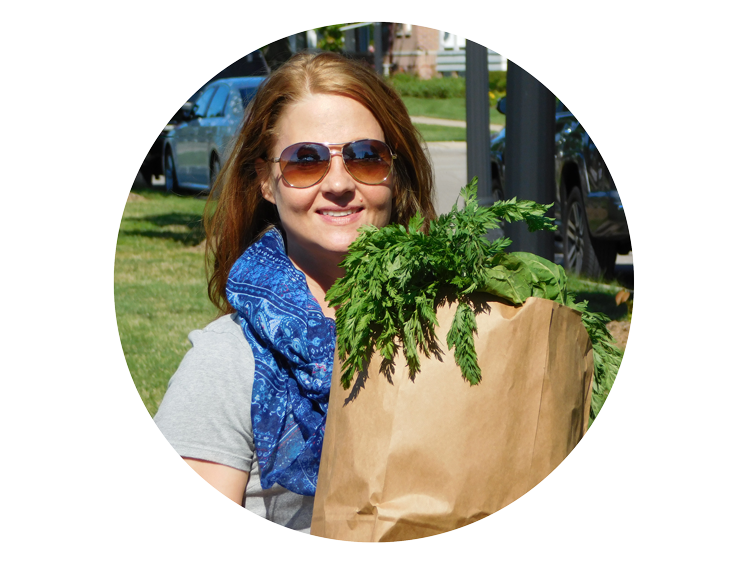 In the first half of Homegrown Paleo, Diana Rodgers teaches us how to grow and raise our own food (no matter how much yard space you have). The other half of the book is seasonal recipes (no matter if you grow your own food or buy it. The recipes are delicious and creative. Some are very simple, some take a little effort, but none are too complicated for the average cook. The recipes are a bit more sophisticated and geared a little more towards adults. I like this book because it has practical ideas and instructions for starting a garden. This is a great way to involve your whole family in their food! 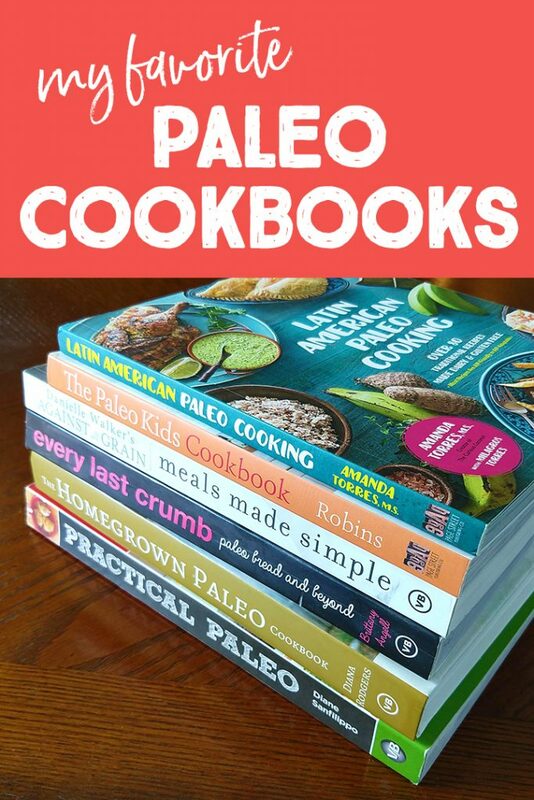 This is considered one of the best paleo cookbooks available! Michele Tam’s recipes are very interesting, delicious, and well written. Many of them are super simple, but have a lot of flavor. Michelle Tam puts umami flavor into many of her recipes. The recipes range from basic side dishes to unique recipes that you won’t find anywhere else. They even include step-by-step photo directions, which is really helpful! My favorites: many of the deviled egg recipes, mayonnaise, Pressure-Cooked Spicy Collards & Bacon, and Kahlua pig! This book focuses on recipes from the Caribbean and Central and South America (not Mexican recipes). Many of the recipes are very traditional and are already naturally paleo, and some are paleo recreations of Latin dishes. The ones I have tried are delicious! Danielle Walker’s recipes are amazing! Some are rather time consuming, but they are very well written and really delicious. Her dessert recipes are fantastic and don’t leave you wanting flour and refined sugar based ones. The brownies from Meals Made Simple are the best—you can’t tell at all that they are grain free! (bake them in a 13 x 9” dish for fudgier, more traditional brownies)! If you or your family has allergies or eat grain free and want breads or baked goods, you need this book! Every Last Crumb has tons of kid-friendly grain free/ allergen free recipes for all things baked, like English muffins, croissants, cakes, buns, and pretzels, along with a bunch of waffles and tortillas! Lots of kid friendly options. I like this book because there are times when you really want bread of some type to go with a meal. This book has you covered! My favorites: Garlic Breadsticks, Extra Crispy Paleo Waffles, Strawberry Waffles, and PMS Brownies. 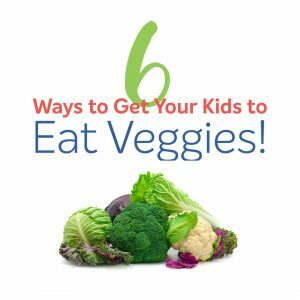 The recipes in this book are geared 100% toward kids and the foods they love. Some recipes are super simple, and others require a bit of work because they are recreations of foods that are not typically grain and dairy free (like mini pizzas or pizza pockets—you make the crust, the cheese and the sauce)! I love that it is possible to make these foods, but they do take more time. I actually don’t make the recipes in this book too often because my kids are a little older, but if I had toddlers or young kids, the recipes in this one are awesome. I still want to try the graham cracker recipe! Juli Bauer’s Paleo Cookbook, Juli Bauer (I don’t have this one for some odd reason, but the recipes on her site are amazing!